Alzheimer's Moments: It's Swing Time! Most of the recent frustration I have felt was my mother's insistence on doing yard work. I'd have to worry about her overdoing it, feeling sick and wiped out the next day, or wandering off. It was enough to make me dread the nice weather. It had become a tiring battle that just wore me out. As I've mentioned on here, you can't use rational explanations with a person that thinks irrationally. And they don't ever tire of arguing because each time they start it's a brand new experience for them. Well, I have found an answer. I present to you, my readers, the swing! 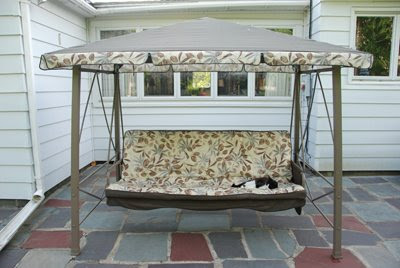 This swing, $200 at KMart and about 3 hours to assemble, was worth every penny and drop of sweat. Mom sits in the swing and rocks for 3-4 hours at a time! Even my brother can't believe she doesn't hop up and start picking weeds. This also keeps her in one place so I don't have to worry about her wandering off. This has made life immeasurable better for me and I think she's enjoying herself more, too. Cat #1, in the picture, spends the better part of her day on the swing and is a great companion for my mom as the two rock the afternoons away. I've also discovered a nice little trick on the weeding. Get rid of the weeds. How did I do that? I put down a barrier in most of the flower beds and covered it with pea gravel. Voila, a 90% reduction in weeds! I love those little victories, where you suddenly figure out a solution to something that's been bugging the hell out of you - and it works. Coping suddenly feels so luxurious. That is sooooo cool!!! I'm amazed that the solution was that simple! Who woulda thunk it? And very strange thing that just happened. I was on youtube checking out a No Doubt video, and then for some reason, typed in Swing in the search field and "swingtown" came up. I ended up closing out of youtube and came to this blog, and what is the topic? Chills! I'm glad that you found a way to keep mum safe, happy, and in the yard (oh and that the plants are now safer too! ).